Now you can easily create great personalized mobile web apps to present your company, business, your work or yourself to customers accessing your information from a mobile device with Octomobi. Octomobi offers cutting edge mobile webapps that work across the widest range of mobile devices, but feel like native mobile applications such as the ones you might download form the Apple App store. 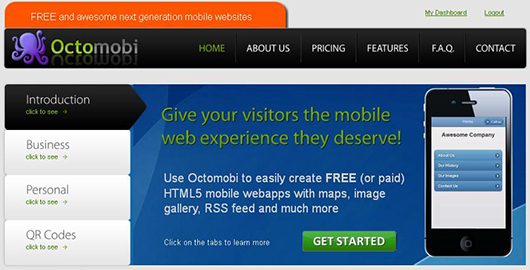 You use Octomobi and you can be in the palm of your client’s hand 24/7. Octomobi just launched its free mobile app wizard that anyone can use to create feature-rich mobile websites, also referred to as ‘webapps’, in a matter of minutes with no technical expertise required. We believe the mobile web will be as important, or even more important than the desktop web in just a few years. Studies have shown that the mobile web is growing at a huge pace every year, however entrepreneurs and individuals are not keeping up, and the vast majority of websites are not mobile optimized. Our aim is to bridge this gap, by offering the best mobile webapp builder in the market, so that anyone can quickly and easily create a mobile webapp without any HTML or programming skills. Our webapps use the latest technology such as HTML and Jquerymobile to ensure maximum flexibility and device compatibility. A Webapp allows your customers to quickly and easily find the information they are looking for. Studies have shown that a typical mobile web user is looking for punctual and specific information, such as opening times, address, phone number, etc. If you use the Pro service, you can also use QR codes, HTML5, maps, and GPS. In other words, your customers will be more convenient to access your company websites from whatever device they own. 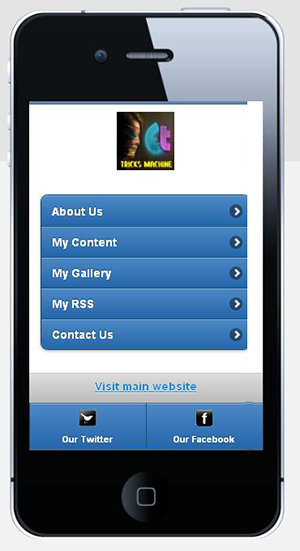 So visit their official website and start creating your own mobile free web apps for your business. I am sure they will help you, share your feedback with us. Next: Should You Hold on to Nokia X7?